Shipboard compass in use as pictured by Stradanus in the late 1580's. The use of the compass for navigating at sea may have begun in China sometime after the year 1000 A.D, spread across the Islamic world, and then to Europe. The European version, after about 1300, paired a pivoted magnetized needle and a card showing wind directions in a glass-covered box. Mounted in line with the ship’s keel, the compass could indicate the ship’s course constantly. The magnetic compass became the key instrument for dead reckoning. Replica of the de' Dondi astrarium, original completed in 1364. The mechanical clock was invented somewhere in Europe just before the thirteenth century ended. The clock began as a crude, weight-driven arrangement of gears, accurate only to the nearest hour and too expensive for all but a few. It evolved into a precise, versatile machine for everyone. The machine’s regularly beating heart was its escapement—the brake that releases the power of a falling weight or an unwinding spring at a controlled rate. Over the centuries, the clock has been a technical marvel, a work of art, and a regulator of the tempo of human life. 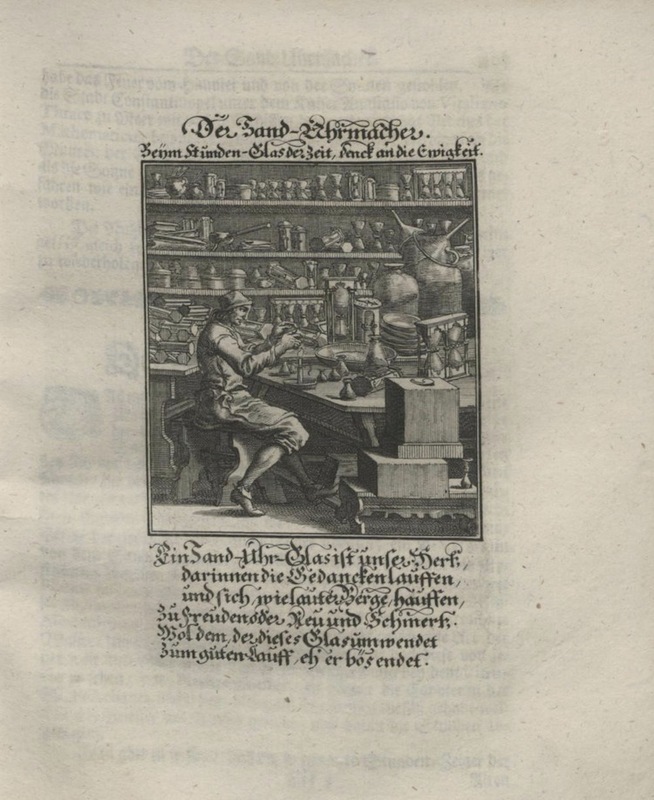 Engraving of "Der Sanduhrmacher (The Sand Clock Maker)" by Christoph Weigel, 1658. Recent studies suggest the sandglass was invented about the same time as the mechanical clock. Francesco da Barberino’s Documenti d’Amore, written about 1310, describes shipboard use of a sandglass in what is believed to be the earliest written reference. In the earliest known image of a sandglass--part of a fresco painted for Palazzo Pubblico, Siena, by Ambrogio Lorenzetti in 1338-39--Temperance, one of the Virtues, holds one. Illustration from "The Complete Works" by Christiaan Huygens, 1658. 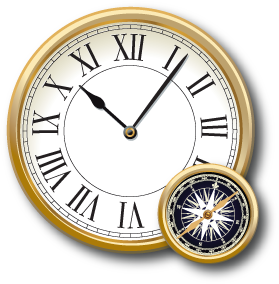 In pursuit of a sea clock, Christiaan Huygens, a mathematician from the Netherlands, patented the first working pendulum clock in 1656. (Galileo had conceived of a clock with a pendulum regulator in 1642, but died before building it.) Pendulum clocks immediately became the best timekeepers for use on land. But several sea trials demonstrated to Huygens that the pendulum clock would never work accurately on a heaving ship’s deck. 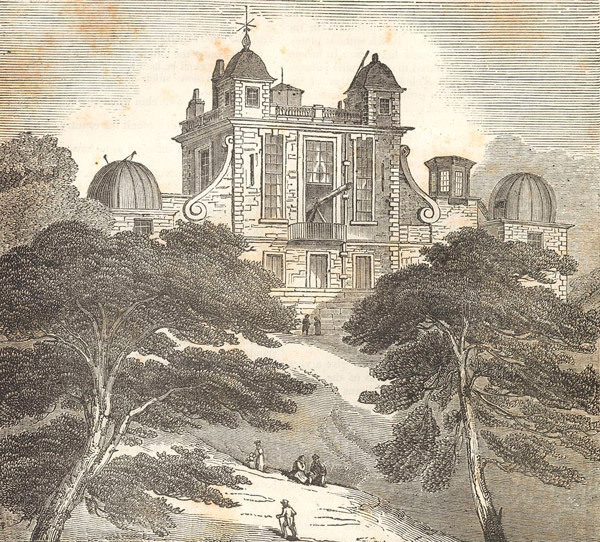 Established by England's King Charles II, the observatory at Greenwich served as the location for accurate measurements of the heavens and, since 1884, was recognized as the international location of the prime meridian, or zero degrees longitude. 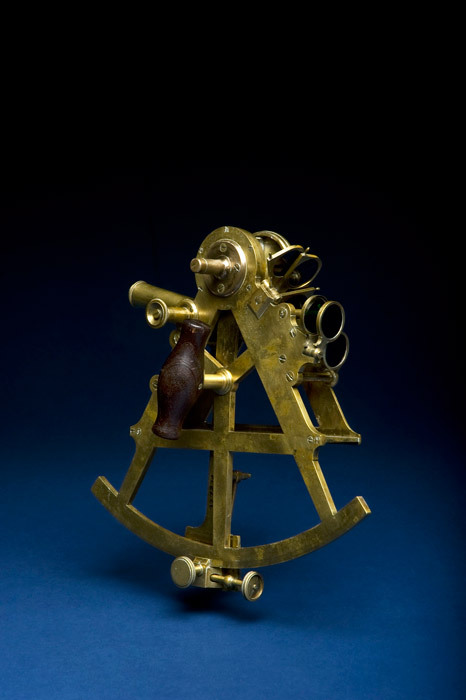 Sextant made by Jesse Ramsden in the last quarter of the 18th century. London instrument maker John Bird made the first sextant in 1757. He received funds from England’s Board of Longitude for publishing two booklets on his craft methods for making and dividing the scales for astronomical instruments like the sextant. 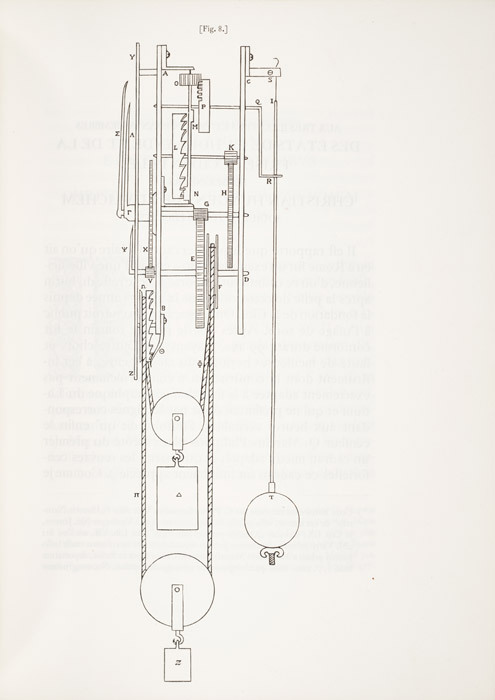 Very shortly thereafter, though, Jesse Ramsden’s dividing engine surpassed Bird’s handwork methods in accuracy and became the foundation of future instrument making. The sextant became the critical instrument for celestial observation. 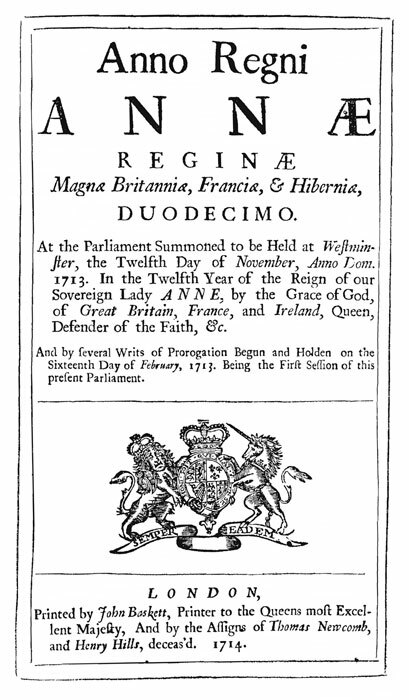 Published acts of Parliament for the year 1714. The English Parliament passed the Longitude Act of 1714, which created a panel of experts to oversee rewards for solving the problem of finding longitude at sea. The act authorized prizes up to £20,000. The legislation came in response to the worst English sea tragedy to that time. While returning from Gibraltar in 1707, a squadron of Royal Navy ships went badly astray off the coast of England, with disastrous results. The flagship, the Association, slammed into the rocks off the Scilly Isles and sank within minutes. Three other ships and over 1,000 men were lost to the sea. Portrait of John Harrison by James King, 1766. 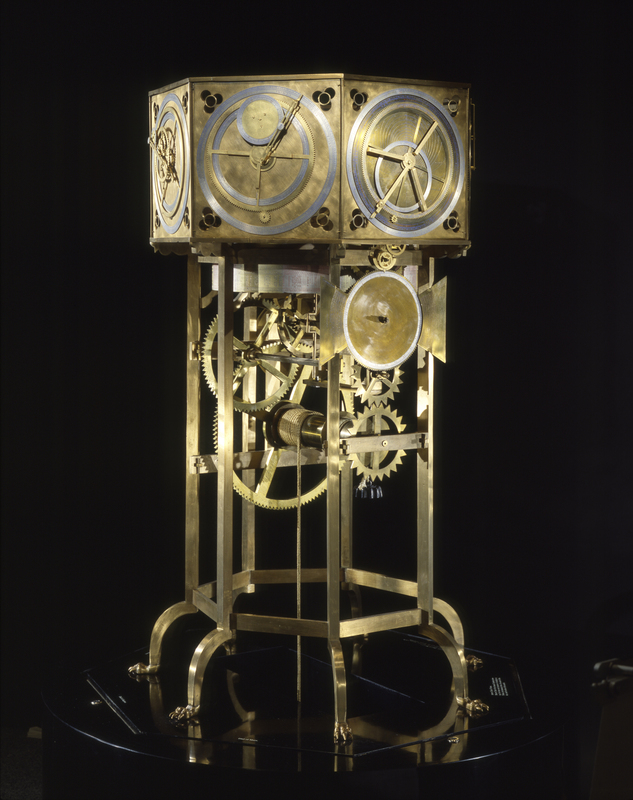 English carpenter and clockmaker John Harrison built five experimental sea clocks between 1735 and 1772. With them, he demonstrated the feasibility of accurate timekeeping at sea and won cash prizes established under the 1714 Longitude Act. His best timepiece tested at sea—a large, silver-cased watch—kept time with an accuracy of about 1/5th of a second per day. 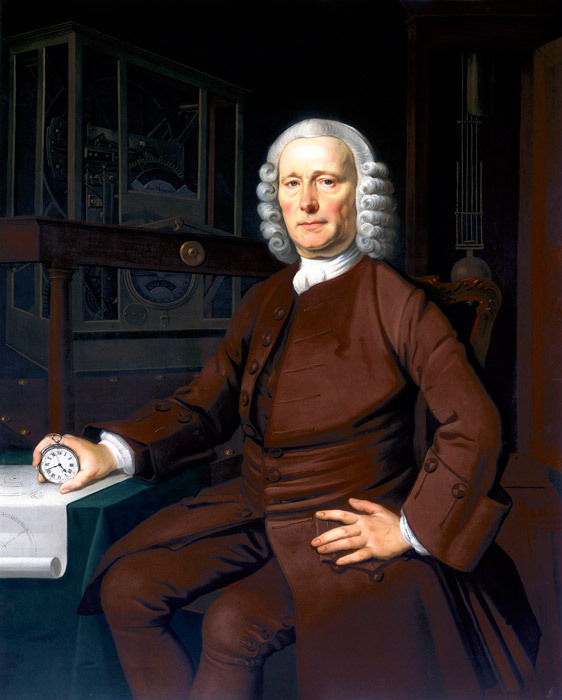 Harrison's work pointed the way for the development of the modern marine chronometer. Title page to the earliest edition of England’s Nautical Almanac. 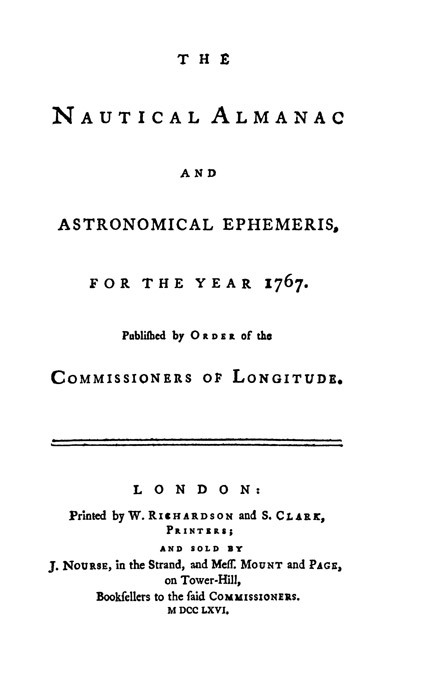 The first edition of England’s Nautical Alamanac, published in 1766 with data for 1767, contained tables related to efforts to determine longitude by means of lunar distance, a method of celestial navigation based on knowing the Moon’s position relative to other celestial bodies at specific places and times. Annual publication of astronomical data essential to navigation followed. The almanac inspired the publication of others, including a version for American mariners. The American Ephemeris and Nautical Almanac began in 1852 with data for 1855. Since 1958, a joint Nautical Almanac has been published for both the U.S. Navy and the Royal Navy. “Sir Cloudisly Shovel [sic] in the Association with the Eagle, Rumney and the Firebrand, Lost on the Rocks of Scilly, October 22, 1707,” artist unknown, 18th century. 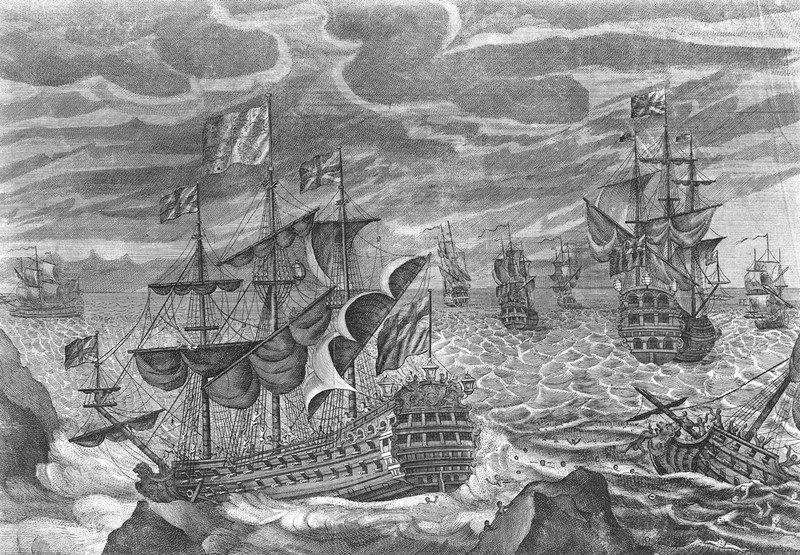 While returning from Gibraltar in 1707, a squadron of British Royal Navy ships went badly astray off the coast of England, with disastrous results. The tragedy, the worst maritime disaster in British history to that time, provoked demands for safer navigation. Parliament passed the Longitude Act of 1714, which created a panel of experts to oversee rewards for solving the problem of finding longitude at sea. Graphic representing Thomas Sumner's line of position technique. While nearing land on his way to Scotland in 1837, Captain Thomas Sumner of Boston had an insight that ultimately changed the practice of celestial navigation. 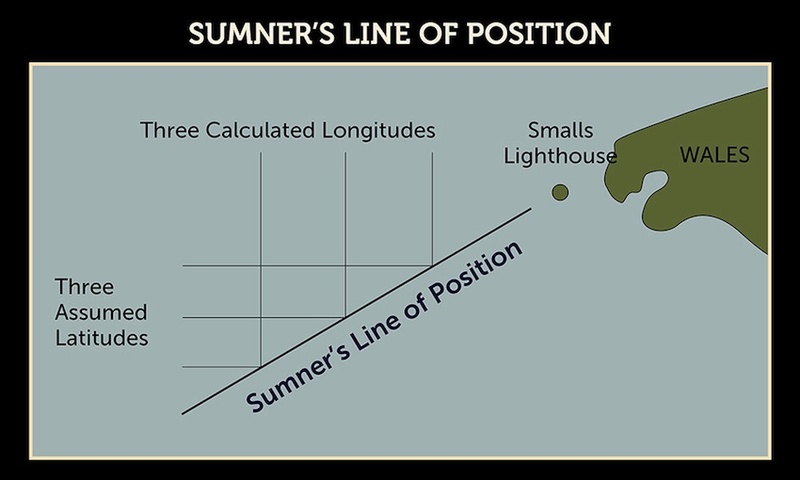 With only one sighting on the Sun, Sumner made three different calculations based on estimates of his latitude. Plotted on a chart, the results lay along a straight line. He realized that any ship seeing the Sun at the same altitude in the sky must be located somewhere on that line. This was confirmed by sailing along that course until a lighthouse was sighted on the coast. Sumner published his method for determining what was later called a “line of position” in 1843. In 1838, six U.S. Navy vessels set out on a great voyage of exploration. 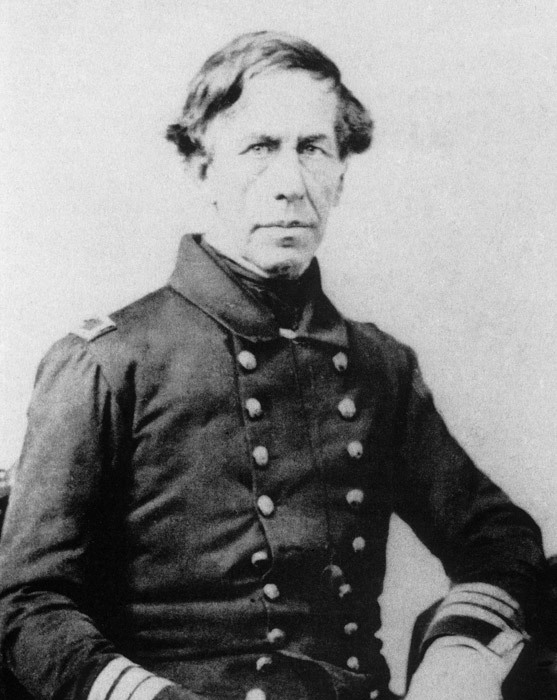 Aboard were several hundred seamen and scientists under the command of Lieutenant Charles Wilkes. Authorized by Congress, the U.S. Exploring Expedition (also known as the Wilkes Expedition) would explore and map the Pacific, Antarctica, and the northwest coast of the United States. A tremendous feat of navigation, the expedition broadened knowledge of uncharted areas of the world and helped expand American commerce, industry, and scientific knowledge. 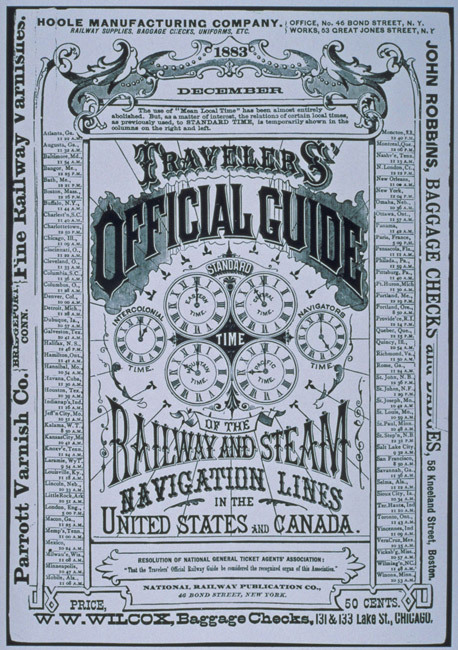 Cover, Travelers’ Official Guide, December 1883. On November 18, 1883, Standard Railway Time went into effect in North America. Most United States and Canadian railroads replaced nearly fifty local times with five zones–Intercolonial, Eastern, Central, Mountain, and Pacific–each of which had a uniform time within its boundaries. The zones were calculated on meridians, 15 degrees apart, counted from Greenwich as the prime meridian (0 degrees longitude). Although pockets of resistance to railroad standard time persisted into the twentieth century, most large cities in North America immediately adopted it. The Standard Time Act of 1918 made the system federal law. 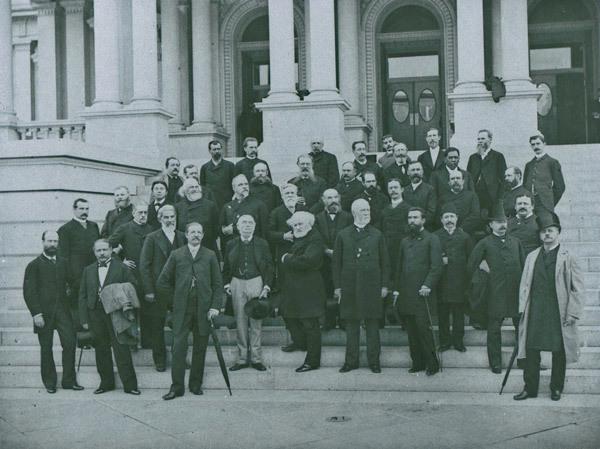 In October 1884, diplomats and technical specialists gathered in Washington, D.C. to consider establishing a single internationally-recognized prime meridian. The International Meridian Conference recommended that the nations of the world establish a prime meridian at Greenwich, England; count longitude east and west from the prime meridian up to 180 degrees in each direction; and adopt a universal day beginning at Greenwich at midnight there. The conference suggestions resulted in the gradual worldwide adoption of a time-zone based system counted from Greenwich at zero degrees longitude. A nationwide system of directional radio beams to provide guidance for commercial aircraft. Credit: National Archives and Records Administration. 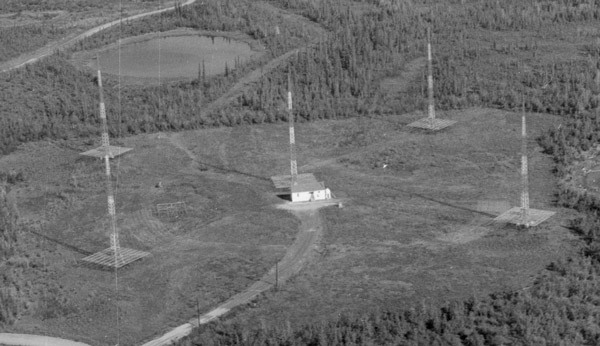 The U.S. National Bureau of Standards undertook the creation of a nationwide system of directional radio beams called the Radio Range to provide guidance for commercial aircraft. This system remained in use in the United States until the early 1970s. Ettore Bellini and Alessandro Tosi in Italy developed the first practical direction finding system. Ettore Bellini and Alessandro Tosi in Italy developed the first practical direction finding system. Direction finding was used operationally in World War I. 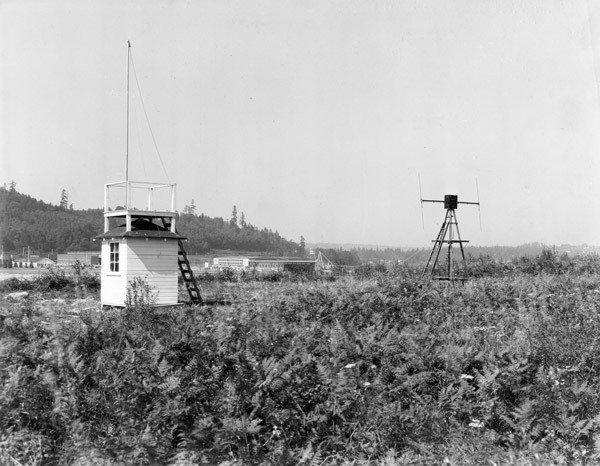 By the early 1920s, a series of stations in Europe and North America were providing guidance to ships and aircraft. 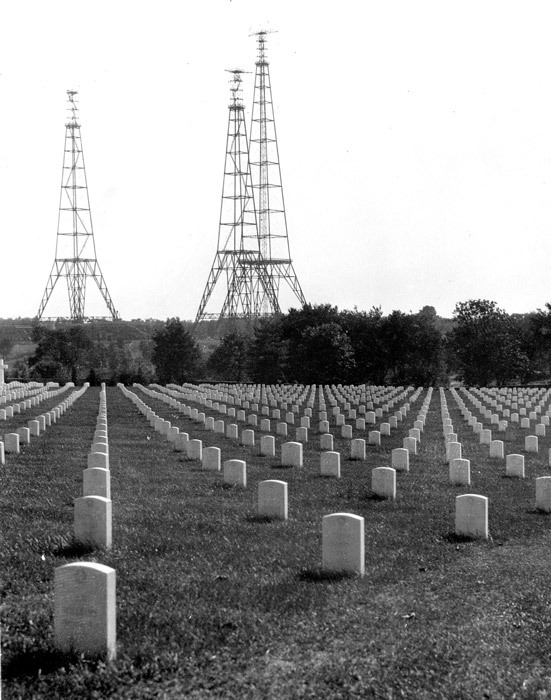 Towers for U.S. Navy radio station NAA, Arlington, Virginia. The U.S. Navy established a radio station NAA in Arlington, Virginia and broadcasted time signals. Longitude between the U.S. Naval Observatory and the Paris Observatory was established through the repeated exchange of radio siganls from the NAA towers in Arlington and the Eiffel Tower in Paris in 1913–14. 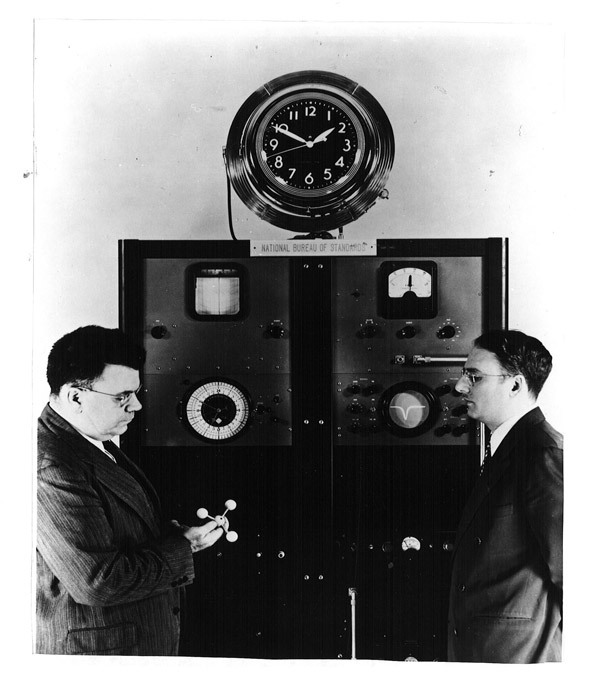 Canadian-born telecommunications engineer Warren Marrison and his supervisor J. W. Horton constructed the first quartz clock at Bell Telephone Laboratories in New York in 1927. The clock emerged from research into reliable ways to measure and control the frequencies for transmitting telephone messages. Marrison and Horton devised an instrument based on the regular vibrations of a quartz crystal in an electrical circuit and a method to convert high-frequency quartz vibrations—50,000 times a second— to one-second pulses to run a clock dial. 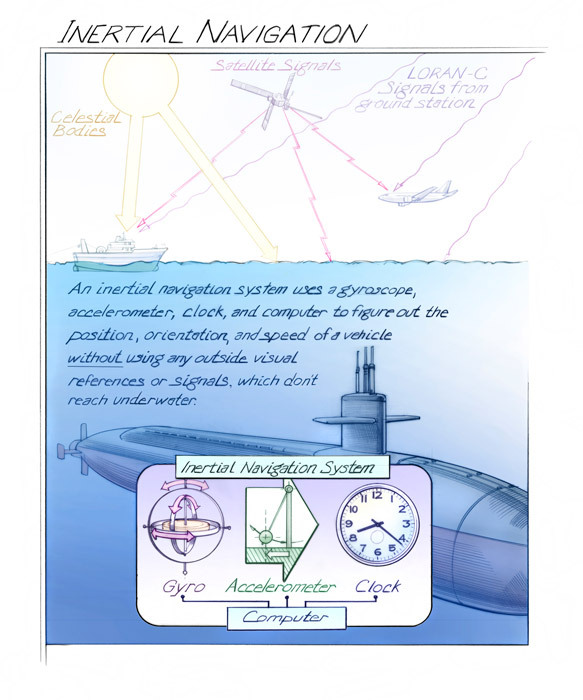 Inertial navigation uses a combination of accelerometers, gyroscopes, a clock, and a comptuer to navigate without any reference to the outside world. Military systems use it because it cannot be jammed, and commercial aircraft use it when out of range of ground-based radar. Transit was a system of satellites that transmitted signals at a precise frequency to receivers on the ground or at sea. By using the Doppler effect, and knowing the location of the satellites, the receivers were able to locate their position with high accuracy. It was later replaced by GPS, which operates on a different principle. 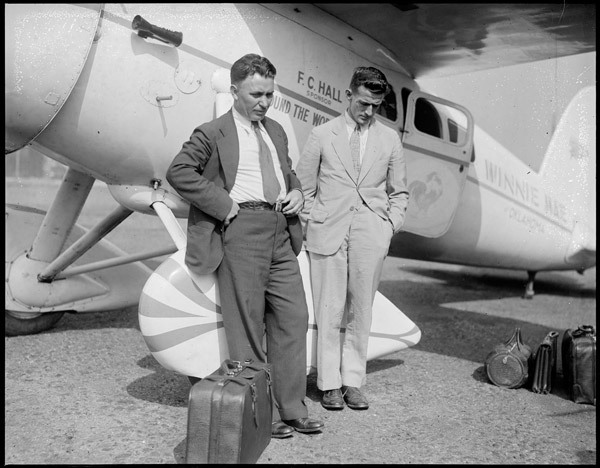 Wiley Post and Harold Gatty shattered the around-the-world record in the Winnie Mae. Wiley Post and Harold Gatty shattered the around-the-world record in the Lockheed Vega Winnie Mae with one of the first demonstrations of effective air navigation equipment and procedures. LORAN became operational, providing oceanic coverage for ships and aircraft. The LORAN system of electronic navigation became operational, providing positioning over much of the Pacific and Atlantic Oceans with an accuracy similar to celestial navigation. The United States shut down its last LORAN transmitters in 2010. The Deep Space Network was created by NASA to track and navigate missions. 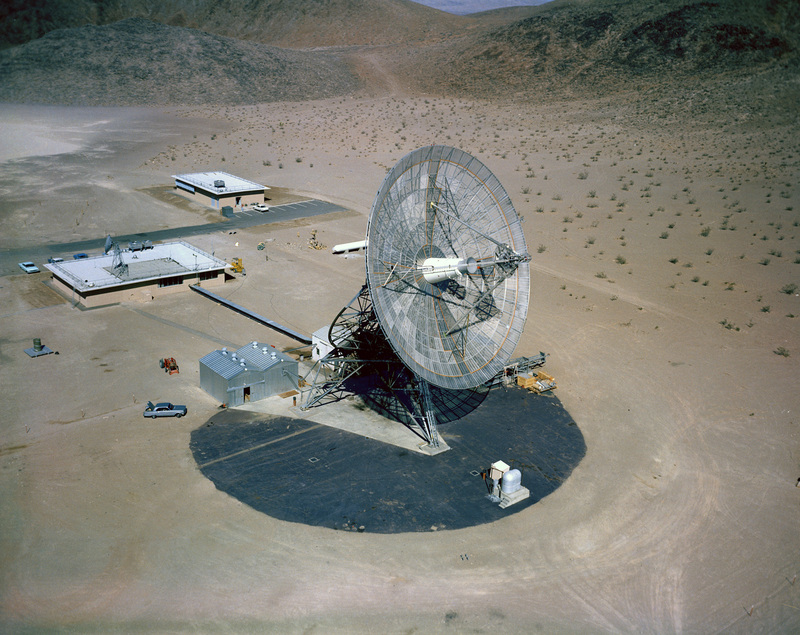 Three stations use huge dish antennas and precise time standards to measure radio signals and determine location of spacecraft across the solar system. The National Bureau of Standards (now National Institute of Standards and Technology) announced the construction of the world's first atomic clock in 1949. The project was an outgrowth of the Burueau's studies for measuring electrical quantities at microwave frequencies. 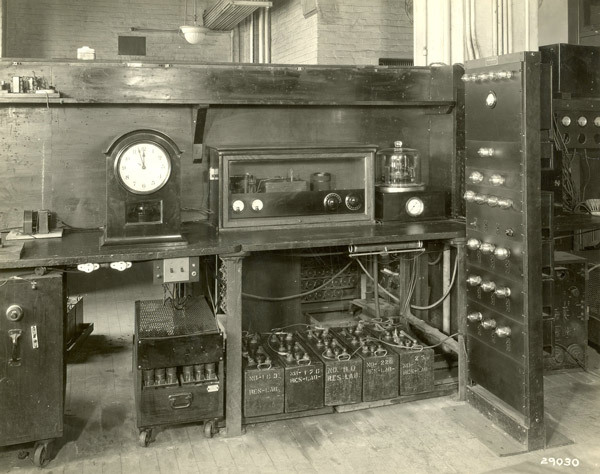 Based on the vibrations of the ammonia molecule, the clock controlled a quartz oscillator to drive a clock dial. 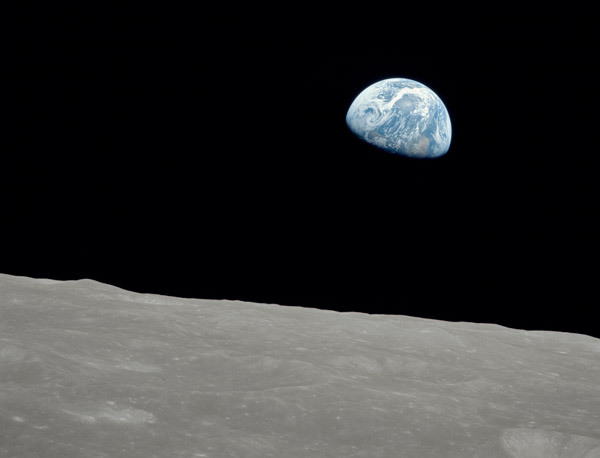 The Apollo 8 mission, launched in December 1968, marked the first time that humans ventured beyond Earth to another heavenly body. The three astronauts on board traveled to the vicinity of the Moon and completed several orbits before returning safely to Earth. The technique of Gravity Assist allows a spacecraft on a mission to deep space to travel long distances with much less fuel than if traveling on a direct route. During its journey, the spacecraft passes by a planet or moon and picks up a small amount of velocity from that body's gravity. That body slows down by an infintesimal amount, which the spacecraft gains as a large change in velocity. 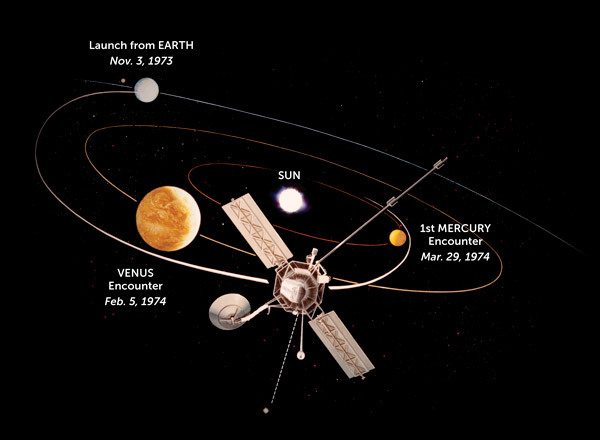 Mariner 10 used a gravity assist flyby of Venus to reach Mercury. 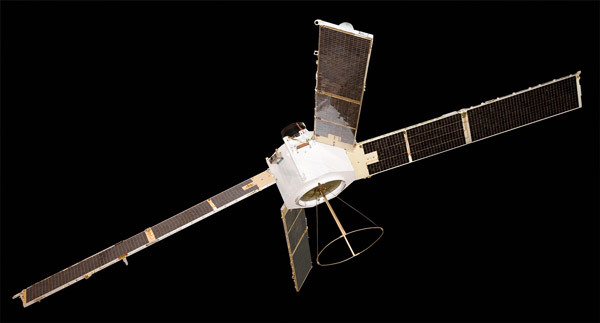 Mariner 10 was the first mission to use a gravity assist flyby to reach another planet. This required accurate navigation and time references to reach the required target near Venus before continuing to Mercury. An international standards group, the 13th General Conference on Weights and Measures, adopted a new definition of the second, the basic unit of time, in 1967. 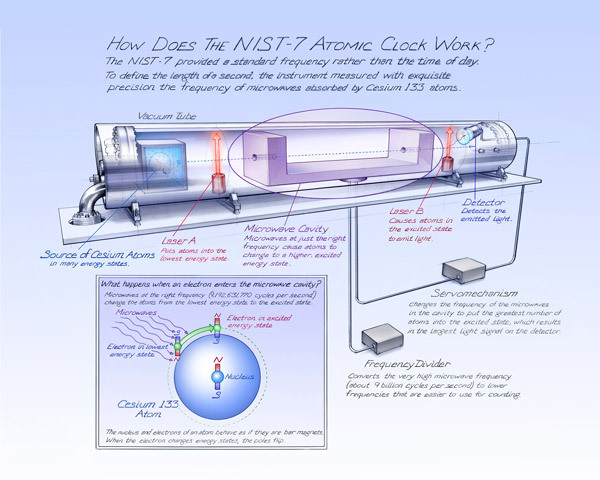 The new second was based on the duration of 9,192,631,770 periods of radiation in an isotope of cesium. Previously, the second had been defined as 1/86,400th of the mean solar day. The change was momentous. Atomic clocks had demonstrated that the unvarying vibrations of atoms were more accurate timekeepers than the irregular daily rotation of the Earth. While flying from Anchorage, Alaska, to Seoul, South Korea, a Korean Air Lines jumbo jetliner strayed into Soviet airspace and was shot down. 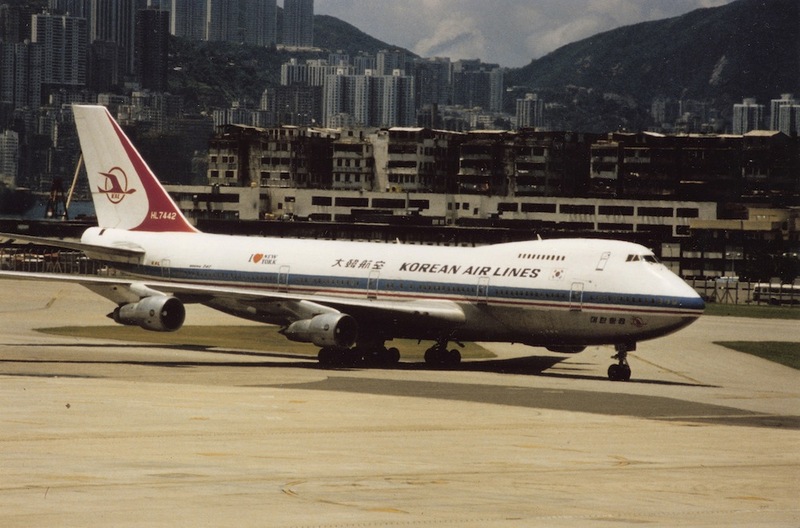 While flying from Anchorage, Alaska, to Seoul, South Korea, on September 1, 1983, a Korean Air Lines jumbo jetliner strayed into Soviet airspace. The error proved tragic. It was seen as a potential threat, and fighter planes were ordered to shoot it down. All 269 people on board perished. The incident greatly increased East-West tensions. 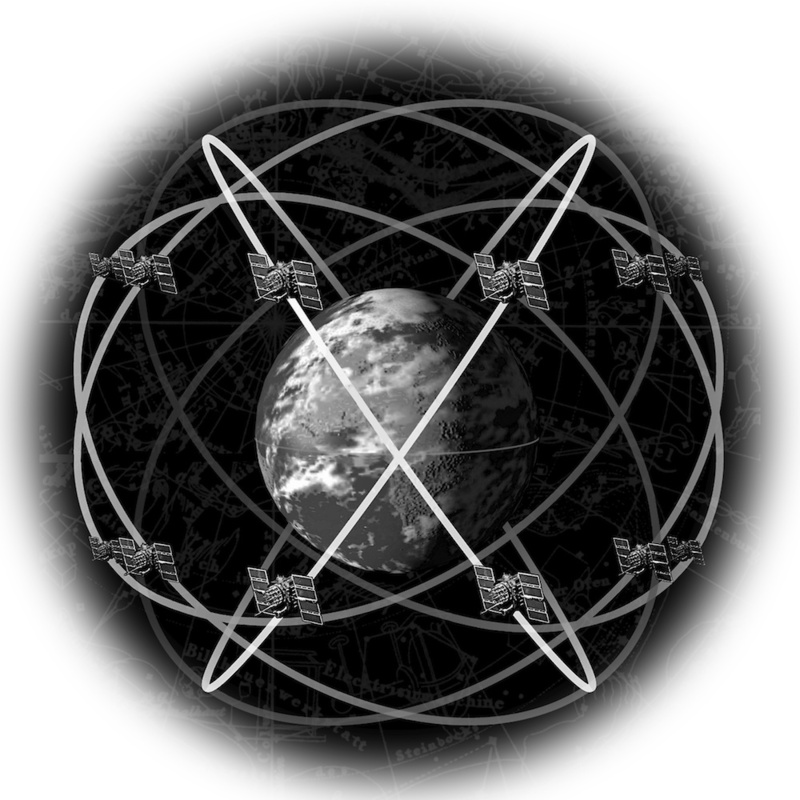 The Global Positioning System was declared operational for global use with 24 satellites in orbit. 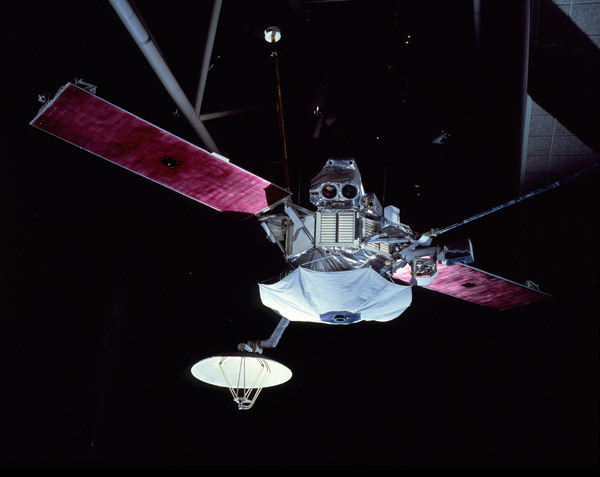 In later years, many more satellites were launched. Intentional errors in time and position signals, known as "Selective Availability," were removed for non-military GPS users. 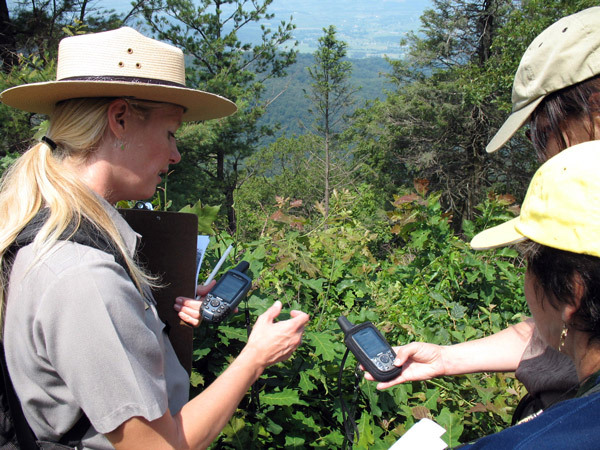 When GPS operations began, signals for non-military users contained intentional errors in timing reference so only military devices could obtain the most accurate positions. This aspect of GPS operations, called "Selective Availability," was permanently removed in 2000. 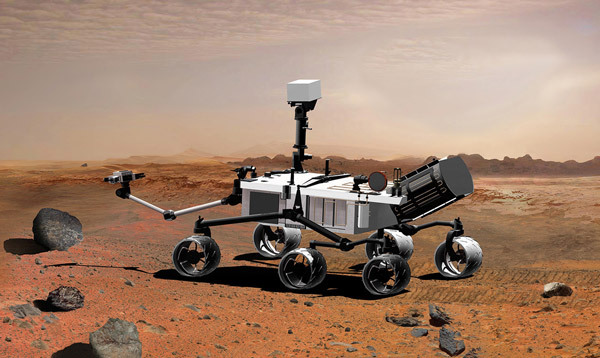 The Mars Science Laboratory Curiosity landed on Mars, reaching a more precise target than previous missions. The Mars Science Laboratory Curiosity landed on Mars, the most accurate landing on Mars to date. Curiosity was succesfully aimed to a target less than 5% the size of the landing target for the Mars Exploration Rovers in 2004.